Take onion, green chilies, fresh coriander, mint in a chopper and chop for 1 minute. Now put meat mince, bengal gram lentil, potato, whole red chili, ginger garlic paste, and all spice powder in chopper and chop. Take out the mixture in a bowl and add chopped green spices. Mix well and make kababs. Dip kababs into beaten egg and fry in a frying pan. Put a shami kabab, salad leaf, tomato slice, cucumber slice, onion and a little chatni, put the other piece of bun on top. 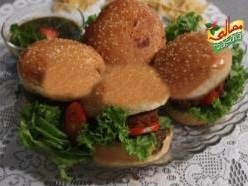 44 comments on "Food Recipes: Shami kai bun kabab"
Hello! This post couldn't be written any better! Reading this post reminds me of my previous room mate! He always kept chatting about this. I will forward this page to him. Pretty sure he will have a good read. Many thanks for sharing! Hi everyone, it's my first visit at this website, and piece of writing is really fruitful designed for me, keep up posting such articles or reviews. Hello to every body, it's my first pay a quick visit of this web site; this weblog includes awesome and genuinely excellent material in support of visitors. in such a perfect method of writing? I've a presentation subsequent week, and I am on the look for such information. upon this I've discovered It absolutely helpful and it has helped me out loads. I hope to contribute & aid other customers like its helped me. Good job. I would ask that you please accept my apology for engaging in manipulative SEO tactics which may cause you to receive a Terms of Service violation from Google. I think that if you remove the following backlinks, the issue can be resolved without any damage to your site's visibility or search engine ranking. I would advise that you delete these backlinks to megasuits.com as soon as you receive this message to avoid any penalties from Google. I would be happy to follow up with you if you have any questions and I would greatly appreciate notification once you have deleted the backlinks. I sincerely apologize for any harm I may have caused.